One of four new C100s built for Ford by John Thompson ahead of the 1982 season, this car was raced extensively by both the factory and the Zakspeed teams. Liveried in Jagermeister colours, it was first raced in two DRM rounds by Klaus Ludwig. Chassis C100/03 was then repainted to factory colours and then raced at the Silverstone, Nürburgring and Le Mans rounds of the World Championship. It was this C100 that briefly led at Le Mans before electrics issues ended the charge. Later in the year it also raced at Spa and qualified on pole for the Brands Hatch round of the World Championship. It was then sold to the Zakspeed team, who continued to campaign the car with considerable success in the DRM and Interserie championships. Its final outings came with Mike Baretta, who raced for the the Victor Dauer Racing Team in 1986. Baretta would continue to own the car through to 1997. 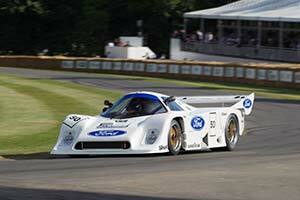 It was then acquired in highly original condition by former racer and Lola owner, the late Martin Birrane. He had the car comprehensively restored to the configuration and livery used by the factory team during the 1982 season. Early in 2019, this, the most successful of all C100s, was offered by Duncan Hamilton ROFGO.